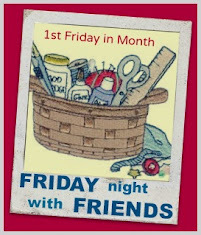 Sugarlane Designs: Are you ready for FNSI???? Are you ready for FNSI???? I am….but I just have to decide what I need to work on first!!!!! I think a priority is working on the final piecing of the SIF BOM “A Year Full of Blooms” so that I can send out the pattern on time (this time!!!!) Oh I really need to work on improving that!!!!! Have you got your nibblies ready for tonight???? Here’s another simple and minimalistic (but oh-so-naughty but nice) recipe you can prepare now and have ready for midway through the night……. 1. Layer malt biscuits in the bottom of a rectangular baking dish. cut them to fit if you need to…. 2. Beat together the cream and condensed milk in a bowl until thick. 4. Mix through the cream mixture. 5. Pour onto the malt biscuit base and smooth flat Layer another layer of malt biscuits on top to cover. 6. Freeze for a minimum of 2 hours . Slice and enjoy!!!!! Notice how the honeycomb creates an oozy caramel drizzle through the ‘ice cream’…….mmmmmm delish!!!!!! Beware…..this dessert is highly addictive and VERY yummy…….it will give you plenty of energy to work your way through the night!!!! Big Christmassy hugs to my friend Margaret for sharing this recipe with me! I just know she won’t mind me sharing it with you all. So….If you haven’t already signed up for FNSI tonight……go back to my last post HERE and sign on! oh that sounds lovely.. my hips have added an inch just looking at the picture! Argh! I can't believe I missed FNSI!! But your dessert looks delish!! Thanks for sharing!! yummo - might be a Christmas Day thing for me too. Oh Yum. That looks too yummy for words. Of course it is low calorie too isnt it. Thanks Wendy for continuing to host this great sew-in for us... you know that we all love a good ole stitch & chat - even if it is cyber!! I was too tired, after shopping most of the day with a 2-year-old, but I'll enjoy seeing what the rest of you do. =) That desert looks completely yummy, and I think I know some things that could substitute for the ingredients we don't have. FNWF and could you be converted!